Adiós Yolanda, ¡que tengas buen viaje!Goodbye Yolanda! Have a good trip! A long long travel overseas like Charles Lindberg. The jewel in the mount look so good. NICE! Glad it arrived safely! Admin wrote: NICE! Glad it arrived safely! Oh no next is in Australia, just opposite in the world to Spain. 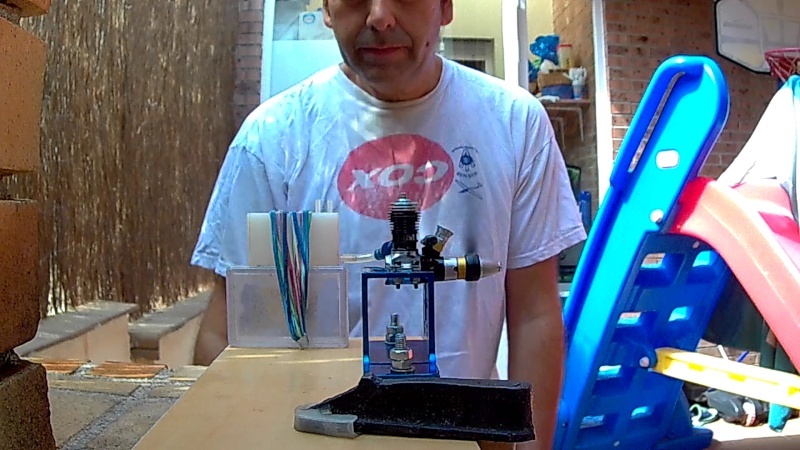 Well, I run this morning the TE and is a powerful engine start easy and turn 13.500 rpm with the big prop 6x3" with 10% nitro and 22% oil (12% castor and 10% Klotz). 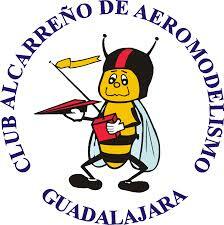 Guadalajara country is famous by the bee honey. 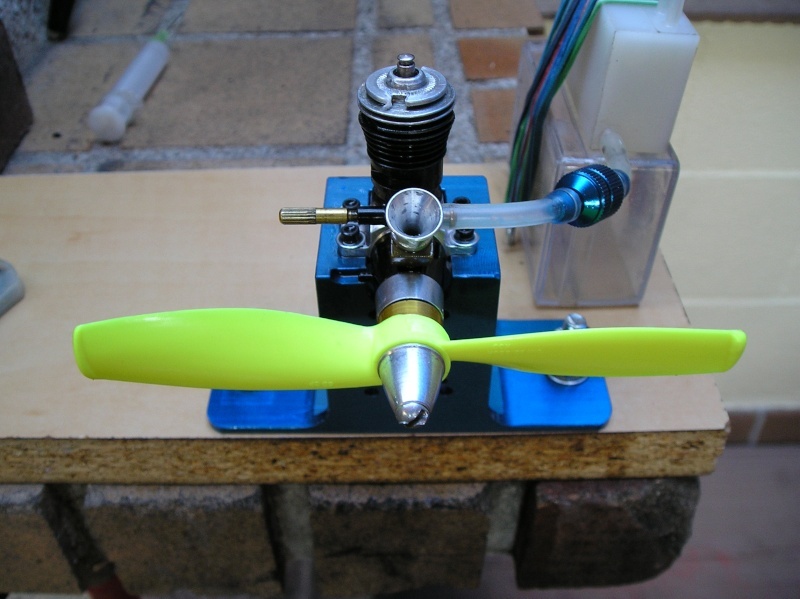 Yes TD Bandit now is ready with the yellow tips reinforced 5x3" propeller and also KK needle valve. Do not worry I have a lot of care and TE is a very easy start. jmcalata wrote: Yes TD Bandit now is ready with the yellow tips reinforced 5x3" propeller and also KK needle valve. 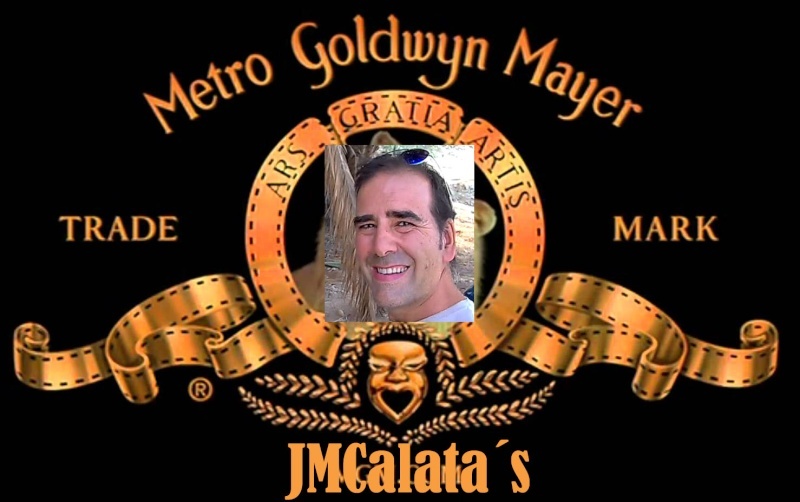 jmcalata wrote: Oh no next is in Australia, just opposite in the world to Spain. 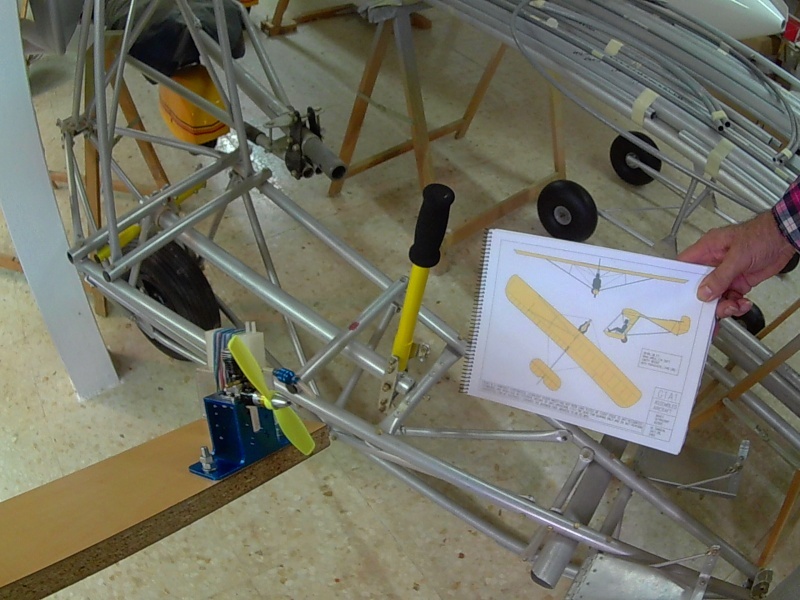 The kk NV come adjusted, I prime engine covering venturi with a finger a turn props twice, I see fuel come into, and at second flip start flood and come to clean. This KK NV work very well, fine adjust, I start at 4 turns open and close to 3. Hi Eric and rest of Comunity, today and after "siesta" (short time sleeping after lunch) I write about TE 3th day. 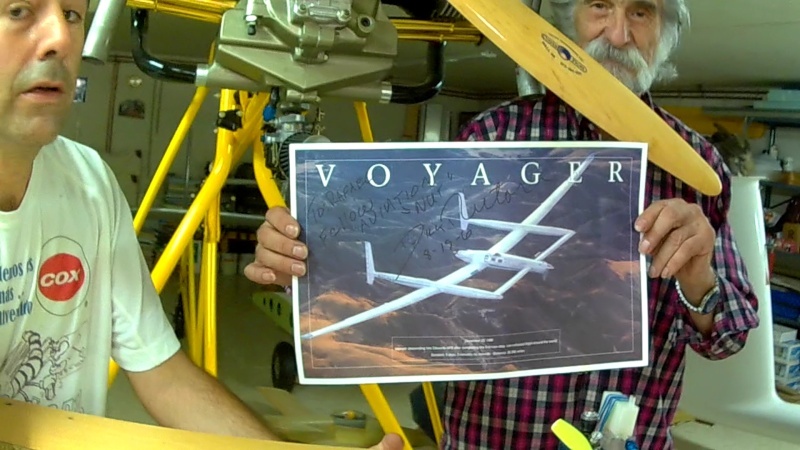 I´ve visited to my special friend and my best teacher "Rafael Gómez Sajardo", he´s the first pioneer of spanish experimental aviation at 70´s of course he learn all in U.S.A.
... and here me and a Rutan´s Voyager signed photo. 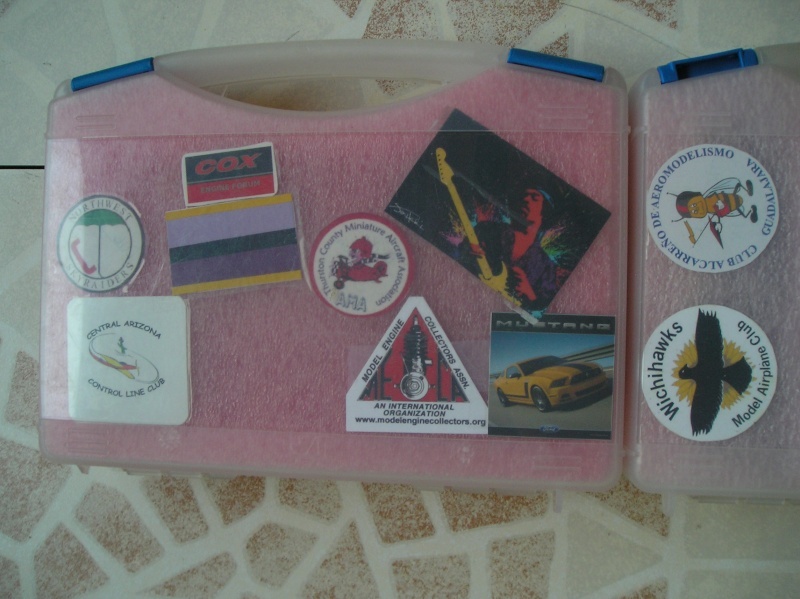 Hes son works fliyng DC3 cargos around California and he´ve worked in maintenance box Iberia airlines company in Chicago, Californa and last 4 years in Canadá. 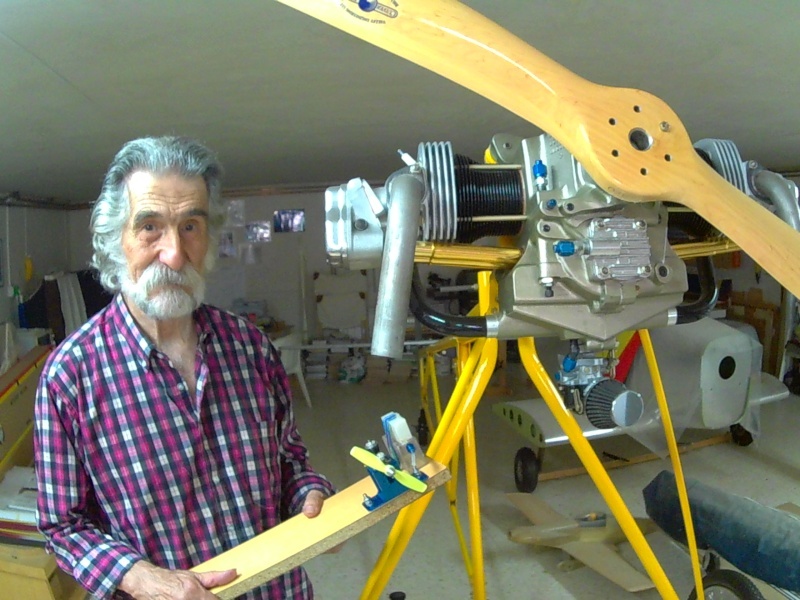 He continue building airplanes and model airplanes and teach all your knowledges to me. Here, building an aluminum tube slope sailplanec called Goat. 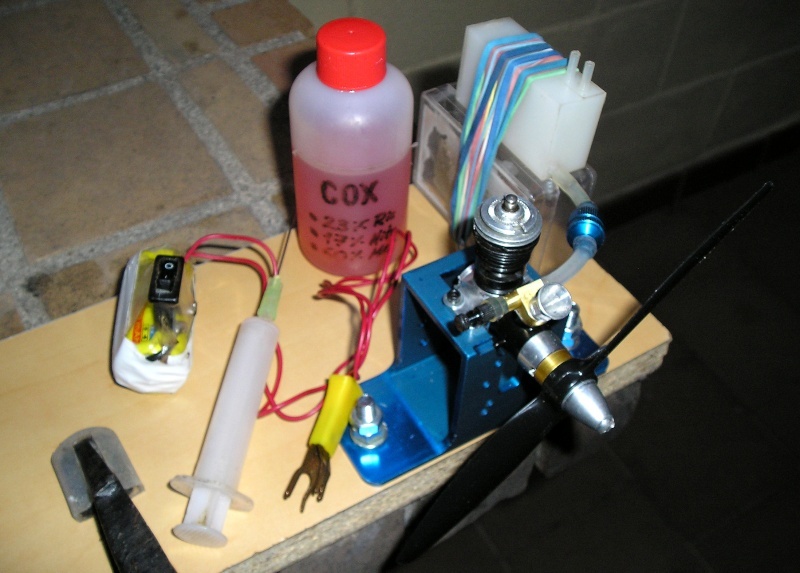 He use the first tee dee in a Scull Master model airplane with a Mule pulse trasmitter ... one pulse right and two left ... he lost the airplane in a big thermal and recovery after one year and Tee dee start perfectly. 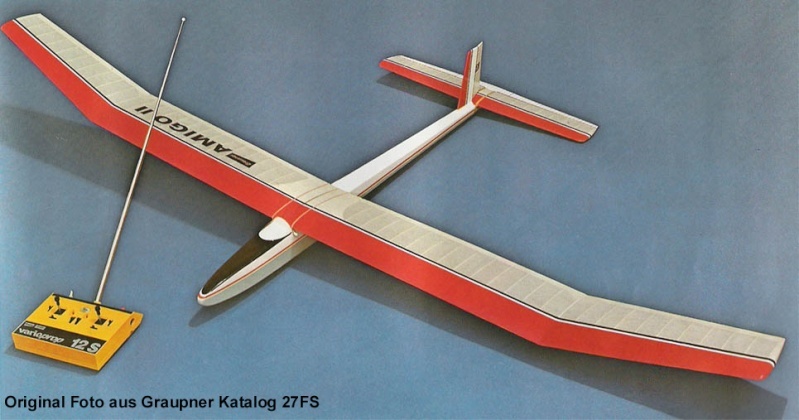 He use also Tee dee .049 engines when he was young in a deustch motorglider called Amigo II of Graupner. And today he start after 50 years the travelling engine setting at 19.500 rpm for a few seconds and also with 10% nitro fuel. 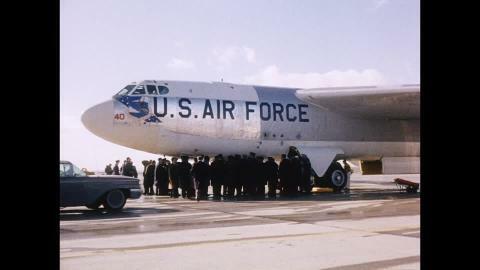 In the 70´s fuel and engines were suply in american aircraft military base in Torrejón (Madrid). Video edition take time. I accept suggestions for video vintage music songs. Many problems to put Jimi Hendrix music on the soundtrack, even buying the music, so each put the music that you like more background. Super presentations Jose! 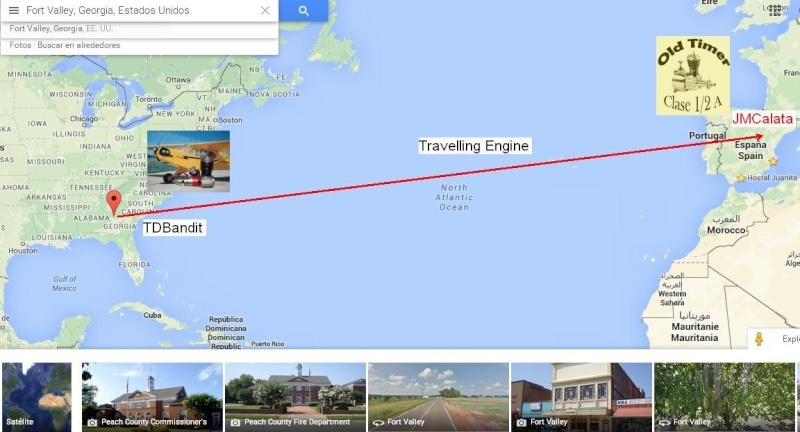 You really have the spirit of the Traveling Engine. Wonderful it is now an International Traveler. 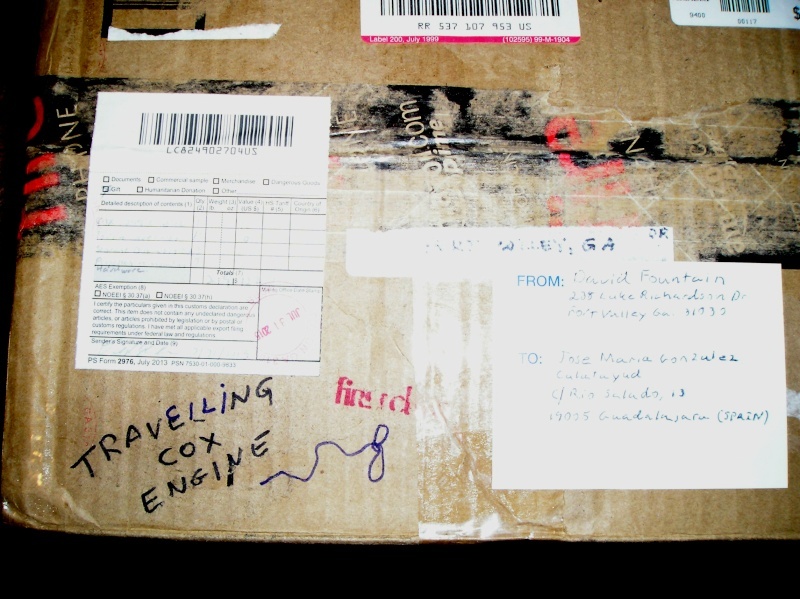 Cox members should see you other engine presentations. Hello friends, thank you all for your nice comments, I'm so glad you like it. I'm people without complexes , I love very much this hobby like you, I do all the things with passion so good humor is the best philosophy of life and hope fun a lot with small vintage engines for long time. 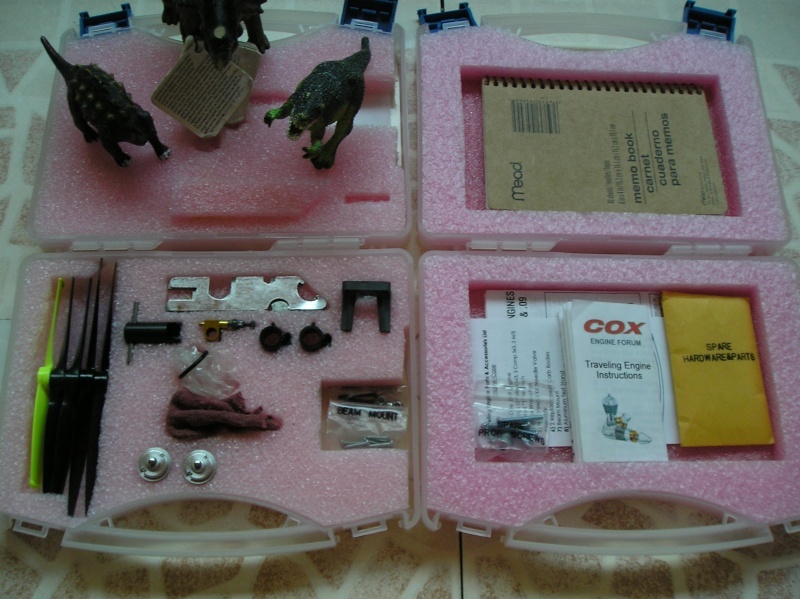 I am very happy with the TE and don`t worry, I'll be very careful. PS: Thankyou Eric I have some film director vocation, great for the wonderful video of Jimi (Hendrix and BB king are the best), I like also blues music, I play guitar and bass, but by the way I´ve also a Baby Clown. Very nice write up from Spain .. I enjoyed it very much!! Great video and pictures! I enjoy seeing you enjoy the engine! Lots of fun! 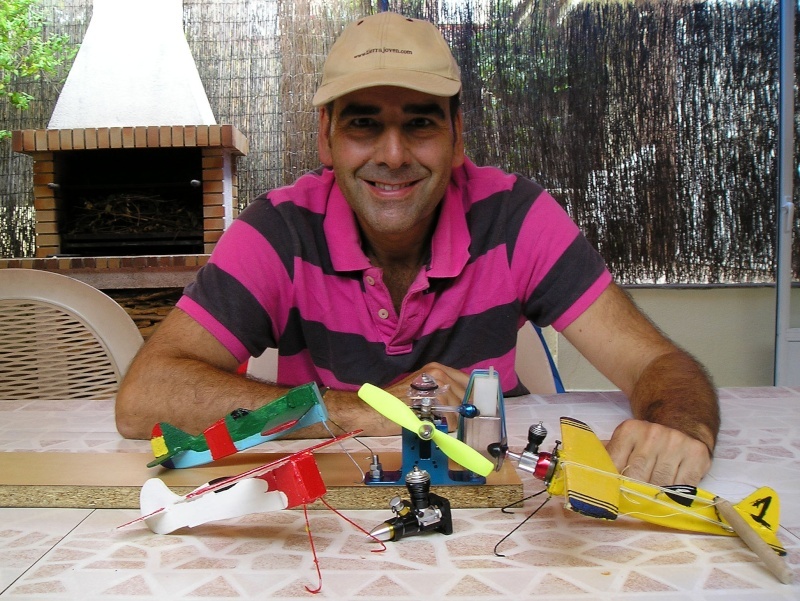 Now , I take a pics with one of my best home-build model-airplanes with Mr. Travelling Engine of course flight videos. I've done this year with my students of technology. wow i wish i had a technology teacher like that!